this strip of paradise is brimming with animation and striking views. The Hampton’s party-going cousin holds a historic reputation for a place to see and a place to be seen. It was a place where good times could be found, particularly for the sexually liberated young man, and still is to this today. The island was notorious for hosting near-naked black tie galas and impromptu fashion shows by Diane von Furstenberg (formerly Princess Diane of Fürstenberg is a Belgian-American fashion designer best known for her iconic wrap dress). Even Calvin Klein termed this oasis home and Truman Capote wrote, “Breakfast at Tiffany’s” from one its lovely beach houses. The island’s exploits have soon passed into legend, however the stunning architecture remains, as well as the party fever. 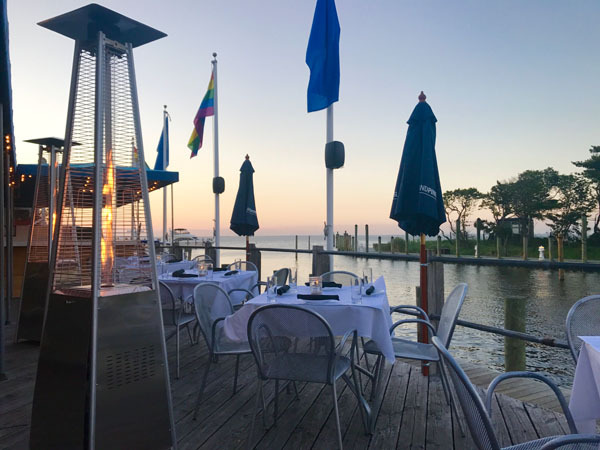 Kenneth Sullivan, the Director of Marketing at Fire Island Pines boasts about the charming bistros, clubs and luxurious accommodations for guests who visit the resplendent resort. If you’re looking for a place to sit back and relax the Bistro is the place to be. The Pines Bistro and Martini Bar is a continental restaurant, which offers traditional favorites, plus daily and seasonal specials. It’s the only establishment in the Pines that offers all-season, sit-down dinner, with a sophisticated cocktail lounge ambience. Indulge in luxury at the Blue Whale, which offers Yacht club dining nightly, in addition to weekend and holiday brunches, nightly teas, a weekend piano bar and more to suit a wide range of tastes. Small plates that showcase a special spin on tapas, featuring fresh local produce, top regional fish and seafood, as well as premium meats and poultry is a favourite at this fine establishment. Dine in simple and elegant an al fresco setting, with unobstructed water views for those perfect afternoon sunsets on the island. Party it up at the Pavilion—the resort mecca for DJ’s and dance music from dusk till dawn. With New York City-quality lighting and sound, world-class talent and the hottest iconic musicians from around the world, this spot is guaranteed to unleash your wild side. Show tunes Sundays and Fun Tea are recent additions to the events calendar, which draws in crowds to the dance floor every weekend. The Sip n Twirl is everything the name says. Sip and socialize during the day at the bar, which is stocked with all your favourite cocktails and more. As soon as nightfall’s, get ready to twirl the night away at the prime nightly lounge and the Pine’s largest and busiest club. The TWIRL deck is perfect for afternoon and evening dancing, before the real party starts inside, with an expansive dance floor and the latest sound technology, along with superb DJ line-ups. Fire Island Pines has everything this summer, for you to escape, party, relax and rejuvenate. This is not only a great resort destination, but it is also considered home for people who visit, particularly due to the fact this establishment blends current residents with travellers, to blur the line between resident and guest.